You’ve driven to the Disneyland Resort, you’ve waited behind a bunch of cars to pay your ridiculous $15 parking fee, you’ve groaned when you’re the last one in the row in the furthest corner of the parking garage (btw, I’ll do a separate post on parking–just stay with me here), you’ve walked through the parking garage and if you have a deployed stroller, you’ve waited for one of two dinky elevators servicing all 5 floors, you get to the tram area and wait for the next available tram–maybe one or two trams fill up before yours. Your sentence gets really long so you start a new one. You board the tram (“all children must be removed from strollers before boarding”) and wait for everyone else, you drive to the tram stop, you prepare to get off but have to wait for everyone else in your row to do so (“please exit on the driver’s right-hand side, and the driver’s right-hand side ONLY”), you lower your head and watch your step, and HUZZAH! You’re ready to play at the park! I mean, not totally wrong. Just that after you get off the tram, you still have to go through bag check (hint: don’t bring a weapon) and then you have to get in the gate. And it all seems simple and straightforward until you end up in some line again and are so done with waiting you want to take a nap and you haven’t even made it past the Flower Mickey yet. 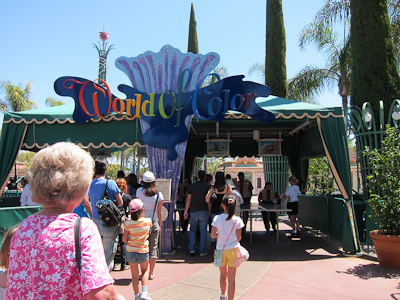 Well, my friends, you can maximize your park-entry strategy, and I am now going to tell you how. 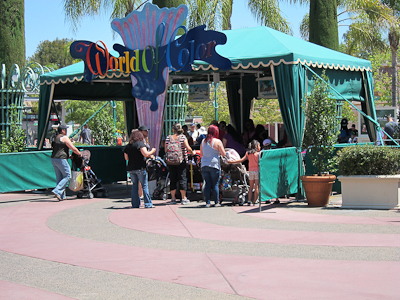 When you reach bag check, look for the line that has the fewest strollers, preferably no strollers. Strollers are not good at bag check, because anyone pushing a stroller ALWAYS has at least one bag, often more, and often they are quite large. The bag checker usually will make them open each pocket (unless you get a slacker), and if you’ve ever seen a diaper bag, you know that most diaper bags have about 734 separate compartments. Which is awesome if you want to keep your sippy cup separate from your diaper cream, but it’s not awesome when the bag checker has to paw through all of it. Thrice for three separate bags. And even though people are mere minutes away from parking their car and packing their stroller, they often forget they have another bag in the basket and they have to pull that out and get that checked too. According to my completely non-scientific, observation-based calculation, it takes approximately 1.5 to 2 times longer for a stroller person to get through bag check than a regular person with a bag. And naturally, it take about ten thousand times longer for a stroller person compared to a person who doesn’t have a bag at all. Which brings me to my next point–teenagers. Now there are times when teenagers are the bane of Disneyland’s existence (speaking as someone who was once a teenaged bane of Disneyland’s existence), but when it comes to getting into the park, teenagers are pretty much your best friend. Why? Because they don’t carry diaper bags. In fact, most of the time they don’t carry bags at all. 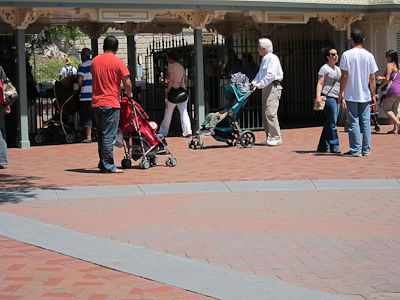 And if they do, it’s usually like one or two backpacks per group, as opposed to 5 or 6 bags per Stroller Person. Yes, I know I’m usually a Stroller Person. Believe me, the irony of this situation is not lost on me. So when you approach the bag check, look for strollers and get in a different line. 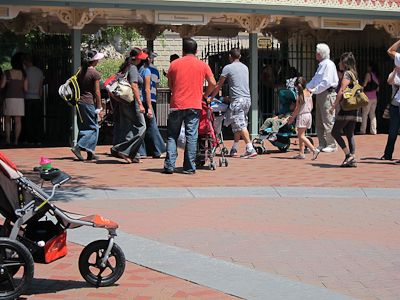 Even if the line has more people–mentally calculate 1.5 to 2 times longer per stroller than per regular person. If those regular people are teenagers, all the better! And also, feel free to break from the herd and look for the lines at the far ends of the tables. As you can see in the second picture above, the cast member to the far right has no line at all. That means that they are available to check your bag. Don’t just wait in line because it seems like that’s something you should do and everyone else is so they must know better than you. Resist the temptation to be a lemming! If you see an open gate, go for it! And go ahead and take the opportunity to unzip your bag BEFORE you get to the bag checker, and then everyone will be happy. Disneyland usually has lovely things decorating the area between the parks, which probably has an official name but I don’t know it. 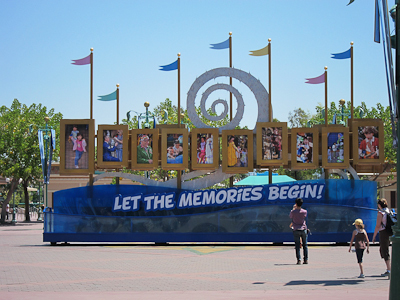 This year’s theme is memories and something something, so the park decoration is retro-styled to evoke all of those positive feeling you had when you were a teenaged bane of Disneyland’s existence. The old entrance sign! Serious nostalgia here. I'm not being snarky. Okay, you’ve made it through bag check! Congratulations! If you need to buy a ticket, your next stop is the ticket booth, but I really can’t offer you any help on that front given that my ticket is good for a year. See how easy this whole post is? You only have to remember two things! At the gate, strollers cannot go through the turnstile. 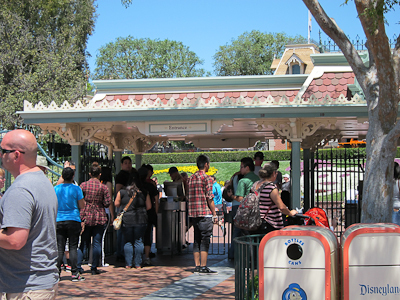 There’s a little swinging gate between turnstiles that the cast member has to physically open to let them in. That means that they have to turn away from their awesome efficiency to scan the stroller-holder’s ticket and then let the stroller through. This takes a lot of time–the 1.5 to 2 times longer estimate holds here–so don’t get behind them. For the love of God--NO! But where do teenagers come in at the gate? Well, this is more another “avoid” than anything, which is to avoid families with children (as opposed to families without children? I don’t know. whatever), particularly families with lots of young children. This is because it’s quite often Daddy who holds all of the tickets and for some bizarre, unknown reason, it doesn’t occur to Daddy that he will need to show these tickets in order to get everyone in, so he does not have them out beforehand. And then he gets to the turnstile and he has to dig into his wallet and say “oh, here you go,” which is frequently followed up with, “oh, you need ALL of them?” Dude, yes. EVERY person needs a ticket unless they are under 2. That’s why you BOUGHT all of those tickets for everyone over 2. This should not come as a surprise that you need to show your tickets–ALL of them. Teenagers, on the other hand, generally carry their own tickets. And because teenagers are used to those newfangled entrance requirements like producing your ticket, they almost always have them out and ready. So, vote YES on a line with a bunch of teenagers. Sometimes you will see a family, even with young children, who all already have their tickets out, one per person, and are ready to go. Feel free to line up behind those families. But seriously, if I had a dollar for every time I’ve seen a family get to the front of the line only to have Daddy start digging through his pocket and wallet to produce tickets like he’s never heard of having to do something like this before, I’d be a very rich woman. Rich enough to be able to scream “THIS ISN’T THAT HARD!” and get away with it. Line to the right? YES! Also, special bonus tip! 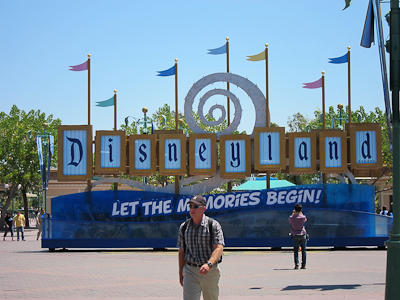 Frequently the gates at the far right of the entrance have fewer people in line. And there you go. Have a magical day! I know, right? For a while I’d just get in the line that looked like it had the fewest people and figure it’s like when you’re at the grocery store and it seems like no matter what line you pick, it’s going to be the slowest. But then I started paying attention and man, those teenagers are seriously efficient. Hm, usually I try to avoid teenagers like the plague, ever since I rode on Splash Mountain with a bunch and they insisted on rocking the “log” so hard that huge waves of water poured over my lap. I may have to rethink that mentality since now I know they can sometimes be used for good, rather than just evil! I think when I was a kid we were one of those rare families where we all had our tickets in hand, ready to enter. My father was seriously the DL general. He would make us wake up at the crack of dawn, be in line in front of the gates an hour before opening, and then hand each of us our ticket with a threat that if we lost it we would probably have to walk back to the hotel by ourselves since he was going in there as soon as the gate opened. Yeah, sharing a log with a bunch of rowdy teens totally bites. But definitely take advantage of their exuberance getting into the park. Kevin’s family was like yours as well, getting up at the crack of dawn waiting for the rope drop and then staying all day until the last possible second where they physically kick you out. My family was significantly more lackadaisical. Great advice! I’d never heard it boiled down so succinctly, and I also like that you’ve figured out what teenagers are good for. People are always surprised when I tell them it takes 30-45 minutes from when you park your car until you’ll be entering the park, but there’s a lot to do! part two: my husband wanted me to be sure and tell you that we found your blog after hearing you on “wait wait don’t tell me”. disney nerds unite! When we went to Epcot in January, (two teens, a twenty-something, and three women) we got there around 9, parked fairly close and had about a five minute walk to the ticket booth, had only one or two people in front of us getting tickets, had a non-existent line to get through the turnstiles, and it still took close to 30 minutes from when we pulled in the gate to when we were in line for Soarin’ (over California, even though it doesn’t say that.) I think that we adults were more excited than the teens…or we were just more urgent when it came to getting from one place to the next. We all had our tickets out and ready to go, though, especially since it’s only a couple of steps from the booth to the turnstiles. OMG, the grocery store! People shouldn’t be surprised when the cashier asks them for money, because the person on the other end of the phone they are too rude to actually put down should have told them. Actually add like 5 mins to the time because I noticed the bag check castmembers are actually checking bags and strollers. Not that I plan to attack my favorite place on earth…just tossing that out there. I didn’t see the bomb sniffing dogs on Tuesday, but I’ve seen them before. I had the same thought you did–oh, I’m going to take their picture! Oh wait, I don’t want to be mistaken for someone looking for holes in the security system! Or like making a joke about terrorism at the airport security line.